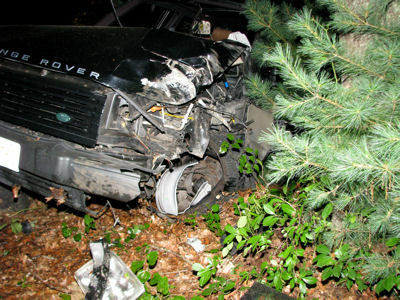 Police allege the driver of this Range Rover was drunk and tried to flee the scene of this crash. 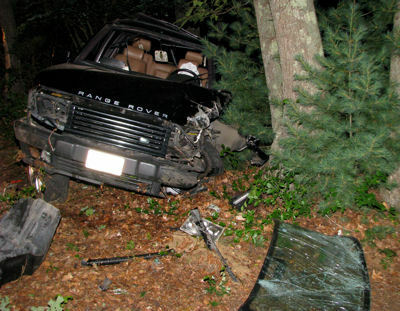 SOUTH DENNIS - Around 1:30 a.m. Sunday, a male driver traveling alone in a Range Rover 4.6 SE lost control of his vehicle eastbound in a curvy, hilly section of Mayfair Road between Follins Bay and Bayview Roads. Evidently traveling at high speed, the vehicle crossed the centerline and crashed into some oak trees, snapping one off. The tree fell across the road blocking the westbound lane. The reportedly intoxicated driver attempted to flee the scene but was apprehended by Dennis police. After being examined by Dennis rescue personnel, the driver refused treatment and was taken into custody. 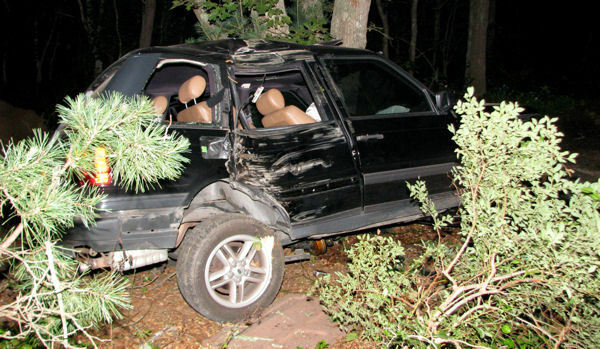 The oak tree against which the vehicle came to rest bore a scar from the collision at least ten feet off the ground. Stark testimony to the violence of the crash, the vehicle's transmission housing was shattered exposing the gears, the windshield was blown out, and a suspension coil spring was torn loose and tossed some ten feet away. A Barnstable County Investigative Officer was called to the scene to assist Dennis Police in the investigation. Story and photos by Kevin Morley.